Spruce up your patio, entrance way, or any garden landscape with the Gronomics Garden Bench. Cedar's natural beauty and durability (highly resistant to decay, insect, and weather damage) make it one of the most popular choices for outdoor and indoor furniture. Sit back and relax in your outdoor space with our Magnolia Ridge cast back bench with seat pad. Great for use in a stand alone setting or let your imagination run wild and combine it with your favorite accent pieces to create a truely one of a kind outdoor oasis. No matter how you choose to decorate, the Magnolia Ridge outdoor bench will provide enjoyment for years to come. The Lifetime Wood Alternative Glider Bench provides the charm of a wooden bench with the convenient low maintenance of high-density plastic. It is constructed of weather-resistant polystyrene and powder-coated steel so there will be no uncomfortable splinters or warping like real wooden benches, and no rusting like metal outdoor furniture. 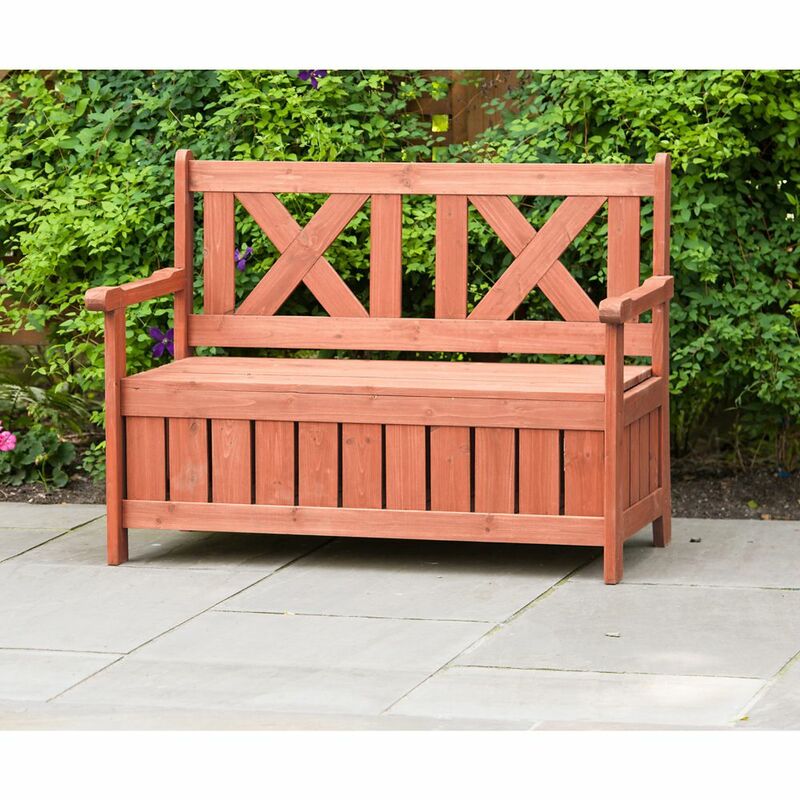 The seat of the garden glider bench is contoured for comfort and designed with slats to allow quick water drainage. Ball bearings provide a smooth, quiet gliding motion for peaceful relaxation in your garden or on your patio. This little bench will be a charming attraction in your yard. Patio Bench with Storage Bench with storage offers an affordable, versatile look for patios or porches of all sizes. Now hats, gloves, lost umbrellas, dog leashes and small toys have a place of their own. An outdoor storage bench that provides wide, comfortable seating and doubles as a storage unit is an attractive essential to any backyard or garden. Special details like roomy armrests and scissor-crossed back invite a relaxing sit down whether you have all day or only a minute. For fast organizing and a charming focal point, this bench with storage is a must-have. Patio Bench with Storage is rated 4.6 out of 5 by 5. Rated 4 out of 5 by Judith from Nice little bench for a good price. I was pleased with the quality of the wood used in the bench. It was sanded very smooth with no splinters or rough edges. Not sure what they used for a stain, it is not oil, so most likely water base. Very soft wood so avoid rough use. Colour is pretty close to picture. Great little bench for entrance way or sun room. Since it is open slats anything you put in it would get wet outdoors. I'm storing all my outdoor pillows in it and the open slats allow them to breathe during the winter. Only thing I would change is the lift off top, I would prefer hinges, but then up goes the price. Rated 4 out of 5 by pkrplyr from value for the price Easy to put together, though I tend to glue to ensure stability and longevity and that was a bit messy, but my choice. Size is as described. Color was red, not blond as shown. Storage space is good, but this is an outdoor piece and the storage area is fully open to rain. I will have to line it. Seat is removable as opposed to hinged - another project for the spring. Not bad for the price. Rated 5 out of 5 by Jokin701 from Great value I bought a bench a couple of months ago. First time ordering online with Home Depot, so I was a bit concerned about quality etc. as it's hard to tell from pics. The service was great and it was delivered on time. Very happy with the product and service. Rated 5 out of 5 by RoyJ from Nice bench! Very easy to assemble. The only issue we have with it is the size of the "lip" to raise the seat to access the storage compartment. Rated 5 out of 5 by Sherrio from Love it! Very easy to put together!... Love it! Very easy to put together!